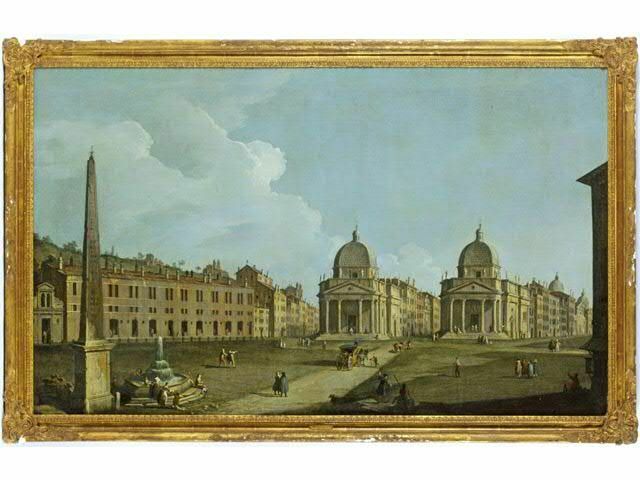 Provenance: Private Collection, Italy (acquired directly from the artist). Acquired from the above by the present owner circa 1995. Literature: M. Tapié, Devenir de Fontana, Turin 1961 (illustrated in colour, unpaged). E. Crispolti, Lucio Fontana: catalogue raisonné des peintures, sculptures et environnements spatiaux, vol. II, Brussels 1974, no. 54 P 12 (illustrated, p. 34). 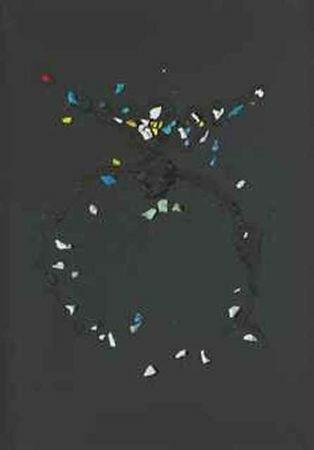 E. Crispolti, Lucio Fontana: catalogo generale, vol. I, Milan 1986, no. 54 P 12 (illustrated, p. 126). E. Crispolti, Lucio Fontana: catalogo ragionato di sculture, dipinti, ambientazioni, vol. I, Milan 2006, no. 54 P 12 (illustrated, p. 266). Exhibited: London, Institute of Contemporary Art, Paintings from the Damiano Collection, 1959, no. 3. Leverkusen, Städtisches Museum, Schloss Morsbroich, Lucio Fontana, 1962, no. 19. (Lucio Fontana, 'Manifesto Blanco', in Lucio Fontana exh. cat,. Rome 1998, p. 115). to the full the sculptural and spatial potential of painting and the twodimensional canvas. 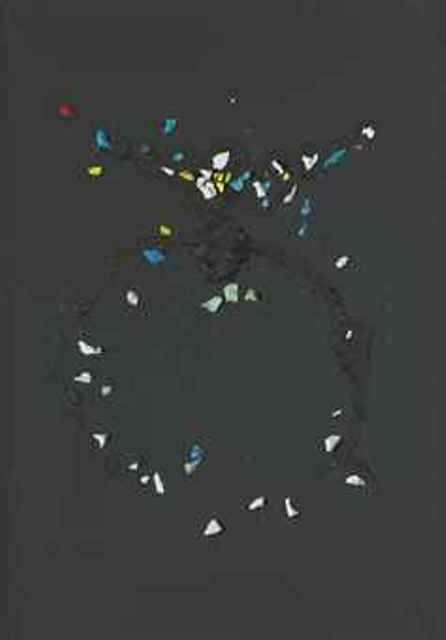 In 1954, in addition to the scattering of stones on the surface of his paintings, Fontana, as in this work, also began to create strange material conglomerations of matter in and amongst his sparkling constellations of holes and shining stones, using thickly-pasted oil paint in a semi-formed and sometimes even diagrammatic or cipher-like way. In this work, Fontana has not only pierced the canvas with his 'holes', tracing spatialist lines across the flat canvas surface, but this sequential progression of voids punctuates a more elaborate and intriguingly textural play of light and matter taking place above the canvas plane in the space of the viewer. coloured glass and porcelain fragments embedded in this 'dark matter' creates two puzzling and seemingly interconnecting and constellationlike clusters of form. Taking on more fully the pictorial ambience of the cosmos than many of his previous works, the combination of punctured buchi and the apparently random scattering of 'pietri' into multidimensional cloud-like constellations in this 1954 pietri suggests a pervasive sense of light, space and material all perpetually colliding in a constant flux of motion set against an apparently infinite monochrome black void. 'When I began using the stones,' Fontana said, 'I wanted to see if I could move forward...I thought that with the stones, the light would flow better - that it would create more the effect of movement' (Lucio Fontana, 1967, quoted in Lucio Fontana, exh. cat. London, 1999, p. 17). It was Fontana's intention with the addition of the pietri to his canvases to open up further the surface of the painting to a multi-dimensional play of light, colour, movement and material as a formalised extension of the way that his 'cuts' and 'holes' had infused the flat two-dimensional plane of the canvas to the infinite dimension of Space. Inspired by the light, space and motion work of avant-garde pioneers such as Laszlo Moholy-Nagy, Fontana wanted also to incorporate such an elemental expression of the fundamental properties of the cosmos into his work. The addition of 'pietri' to his canvases would, he hoped, infuse the surface of his canvases with the disparate elements of light and motion as the light and colour contrasted, reflected and sparkled off the jewellike coloured glass in such a way as to suggest a new multi-dimensional sense of astral space. Commentaires sur Lucio Fontana (1899-1968), Concetto spaziale.